Rabbit anti Goat IgG (Fc) antibody (STAR122P) used as a secondary detection antibody to recognize goat primaries against CINC-1 and neutrophil elastase in rat lung sections by immunohistochemistry on formalin fixed, paraffin embedded tissue sections. Decrease in airway accumulation of neutrophils and CINC-1 following treatment with S-maltoheptaose. (A) Lung tissue sections were stained for NE (a, c, e) or CINC-1 (b, d, f) and then counter-stained with haematoxylin. NE-positive cells lining the basal side of the bronchial epithelium were rarely observed in cases treated with S-maltoheptaose (a vs c, arrows). CINC-1 immuno-positivity enriched along the luminal and basal sides of the bronchial epithelium were barely observable in cases treated with S-maltoheptaose (b vs d, arrowheads). Neither immuno-positivity for NE nor CINC-1 was observable in the sham air controls (e & f). *bronchial lumen. Scale bar = 100μm. From: Lam DC, Chan SC, Mak JC, Freeman C, Ip MS, Shum DK. 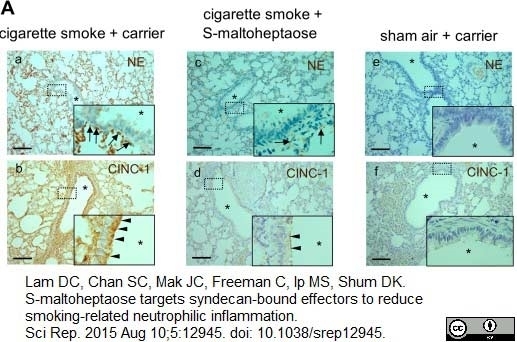 S-maltoheptaose targets syndecan-bound effectors to reduce smoking-related neutrophilic inflammation. Sci Rep. 2015 Aug 10;5:12945. Rabbit anti goat IgG recognizes an epitope localised to the Fc region of goat immunoglobulin G as assessed by immunoelectrophoresis and ELISA. Rabbit anti goat IgG may cross react with IgG from other species. Antisera to goat IgG were raised by repeated immunisations of rabbits with highly purified antigen. Purified IgG was prepared from whole serum by affinity chromatography. J Immunol. 189 (9): 4674-83. Lam, D.C. et al. (2015) S-maltoheptaose targets syndecan-bound effectors to reduce smoking-related neutrophilic inflammation.